In my late teens I did what any child of an atheist father and protestant mother would do: shop for my own religion. I picked up a copy of Religions of Man and read Kahlil Gibran's The Prophet. A decade and a half later, I have learned many things about religion ( "all I know is that I know nothing" ) -- mainly that there is a strong common thread among them all: be good, keep the peace, love people. I'm sure Jesus existed, as did Buddha and Confucius. But I don't buy that God is a white bearded man sitting in the clouds. Where is he on clear days? For me, buddhism seems to be the non-religion that embodies what existence is about. Between this and the ayurvedic view of life, I am getting closer to an idea of "why are we here?" Or more like, how do I get back to what really matters? 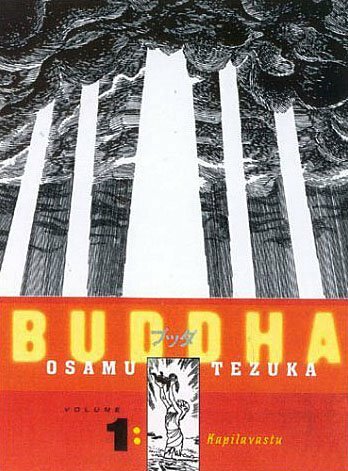 Osamu Tezuka, the creator of Astro Boy, put out a fantastic series of hardcover comic books on the life of Buddha. It's beautiful, strange, engaging and moving. As I flipped through the first volume at The Beguiling, I nearly cried at the introduction. I had to read the entire story after that. I got this out of the library recently. There's some really interesting choices made: instead of the sombre treatment that cartoonists seem to favor when dealing with serious subjects, it features bambi-cute simple depictions of woodland creatures in painstakingly detailed landscapes and the inexplicable use of hiphop slang (moms and peeps).